Sutton Massachusetts Lake Singletary is a lake divided. The Sutton town line slices right across its middle. 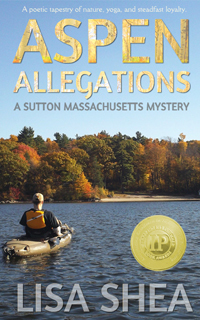 The southern half belongs to Sutton, while the northern half - including the boat ramp area - is in Millbury. The only public location Sutton residents can go to enjoy Lake Singletary is at the Camp Marion site, now the Sutton Town Beach. The rest of the shoreline is privately owned. I have double checked with the Millbury Town Hall and there is definitely NO fee to use the boat ramp. So this is a great way for kayakers and canoers to get their boats into the water. 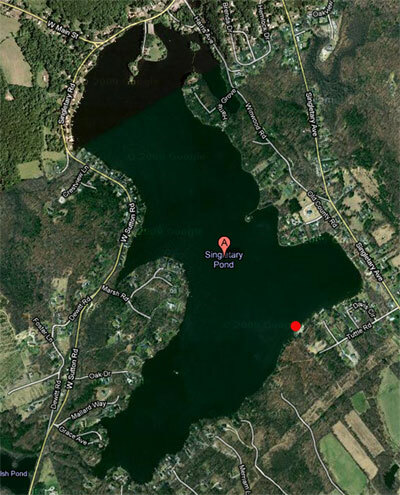 Many years ago, the private Marion Camp at Lake Singletary was bought by the town of Sutton, MA so that this area on the southern edge of Lake Singletary could be used by the residents of Sutton for "all time". 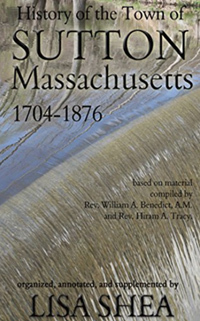 Technically by Massachusetts law this body of water is a "great pond" - Massachusetts only calls these bodies of water ponds or great ponds. A pond becomes a great pond if it's over 10 acres in surface area. 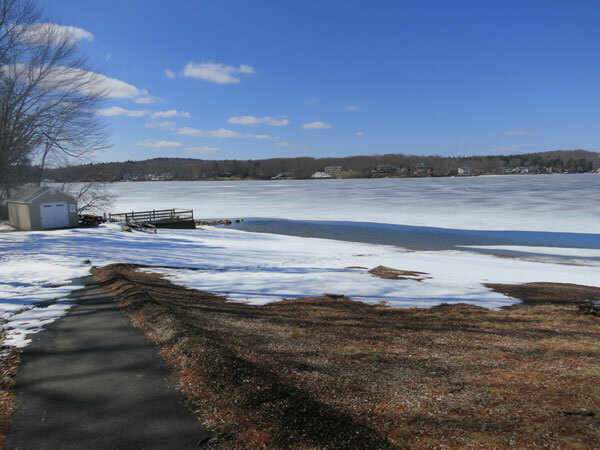 Lake Singletary is 330 acres in size, making it the second largest body of water in Sutton behind Manchaug Pond. A closer look at the location. Note that the "line" on this map is not the town line - it's just a satellite feed line based on where the satellite happened to do its sweep. 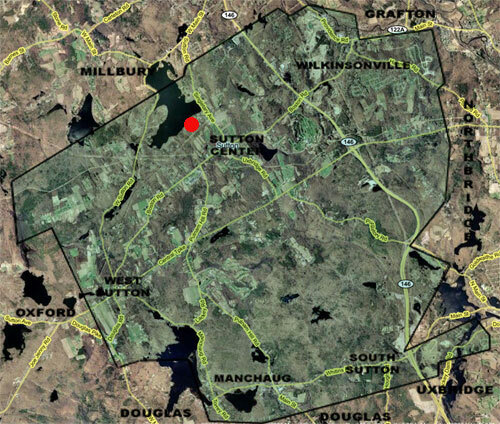 The red dot on the map is the location of the Sutton Town Beach. The boat dock is at the far north. Here's a look at the lake from the town beach, taken in March 2013. Here's a video of Lake Singletary, taken on March 13, 2013. It was VERY windy on that day. The wind whipped off the frozen lake and just howled. The video is in high definition and was taken from Camp Marion / Sutton Town Beach. You can see the island to the right, with the little white cottage on it. You're looking northwest towards the Millbury top end of the lake. Celebrate your enjoyment of Lake Singletary with these gorgeous tshirts, mugs, tote bags, and other items all emblazoned with the serene beach and crisp, blue waters of this lovely area.